Tony Hawk is finished...ish. The worst thing happened - I was about half way through New Orleans, which is the penultimate level on story mode, skating along minding my business. It got to the end of lunch time, so I hit save, the "please wait, saving" screen came up...and I waited...and I waited...and it didn't go away. The Flippin' game had crashed. I reset and reloaded the game, went to load my save, and it just said "damaged" where my game should have been. NOOOOOOOOOO!!!!!!!!!! There is absolutely no way I'm going through the game all over again. If it had just been a case of losing my last progress and restarting from the previous save then I might have done it, but the whole game again? No. Way. It was one of the most frustrating, joypad-smashing experiences I've had in a long time. 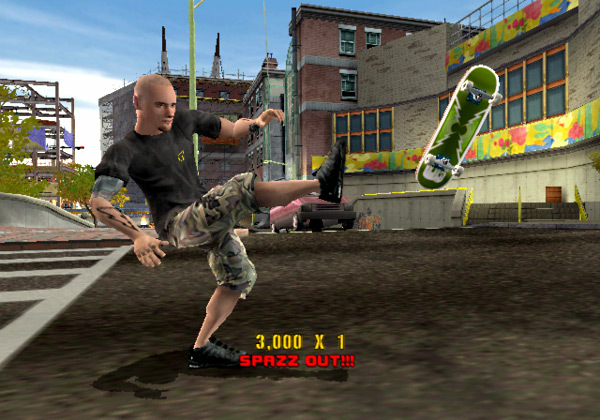 It seemed to combine all of the worst parts of the THPS franchise for me - the whole jackass thing taking away from the actual fun of computer 'boarding. I think it took Skate, which came a few years later, to bring the pure skating back. I've also got a bit further with Beyond Divinity. I can see why people didn't rate it as highly as the first game. There's just no story - well, the story is that I've been soul-linked to a death knight and we have to find a way to remove the curse, but that appears to be the only story. Any side quests I've found so far have just been very basic fetch quests, which don't add anything to the main story line. It's just been a pretty linear hack and slash so far. To make it worse, the developers seem to admit that they don't have the time or the inclination to add a decent story because they've added something called 'battlefields'. These are separate maps - nothing to do with the main game - that you can teleport to in order to wander around and level grind. It's soul destroying. I don't mind a grind when there's a point to it, but this is just grinding for no reason whatsoever. It feels like they've added it just to artificially inflate the length of the game. There are other problems, too. The skill system is terrible compared to the one in Divine Divinity. There's a similar base to it - you can choose to learn any skill, no matter what class you are, but you have to find someone to teach you that skill...but they might only teach you the skill up to a certain level, then you'll have to find another teacher to teach you the skill to a higher level. Also, there are limited skill slots, so you can't just go and add all of the skills that you want (and there are a lot of skills). The game gets around this by allowing you to remove skills you've learned to add new ones - in fact, it actively encourages you to do this in the manual. So I went to try it and found out that it cost thousands of gold pieces to remove a skill - way, way more than it costs to learn one. Why??? What is the point of that? Another questionable decision is the voice acting. I think I mentioned it back when I was playing Divine Divinity - they seem to have picked up a bunch of Europeans to do the voice acting, which gave the first game a quaint, local, amateurish feel, but in this game it's just terrible. The worst of them all is the death knight that you're tethered to, and he's always rabbiting on about some nonsense in his ridiculous voice. Volume down, I think. I've no idea how long the game is, but if it's anything like the first then I've still got a long, long way to go. Hopefully the story will move on a bit along the way. Okay, next up on the randometer is...Rocket Ranger. It's an old Cinemaware game from 1988. It looks like it takes inspiration from the Rocketeer comics, but I don't think it's in any way officially tied to them. Looks fun!